In your RV, you’ll cross from coast to coast along Dwight Eisenhower’s epic interstate system and see the National Parks created by Teddy Roosevelt’s love of the outdoors. You’ll gaze at more stars than you ever thought you’d see in expansive city-less places, and you might even get stuck along some back alley street in one of those cities you’ve never seen. First Aid. Since an RV is essentially a home, you must carry with you all first aid materials you keep at your stationary domicile, namely Band-Aids and antibiotic ointment (Neosporin). Let’s face it, we all have a first aid kit, but Band-Aids and Neosporin are always the first things to run out. Still, you absolutely need to carry gauze, bandages, tape, scissors, air splints, hydrogen peroxide, and foot/hand warmers, as well as any medications and other things that could help in any kind of emergency. Communications. Cell phone service doesn’t last forever, and it may not be there when you need it most (call it Murphy’s Law). Test the communications system in your RV, including CB radios and GPS devices. There are nearly a thousand satellites in orbit around the globe, but there are still some places untouched by the beams of the machines. Be sure to have communication devices other than your cell phone. Backups. Check your tires and the spares. Check your fuses, check your cabin lights, your headlights and taillights and reverse lights. Check them all—and then bring backups. Food. Be sure to have extra food with a longer shelf life on hand. Canned and other packaged goods including soup, crackers, nutrition bars, oatmeal, cereal, etc. Got kids? Then you know the drill. Pop Tarts, Ice-Pops, Twizzlers, and peanut butter and jelly sandwiches should hold over the little ones in case there’s a bump in the road. Equipment. RVs are complex machines. 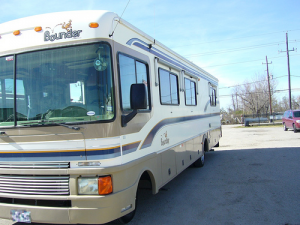 Every RV should be taken care of with a watchful eye, and brushed with a fine-toothed comb. Bring a set of tools that allows you to maintain any RV emergency until you can get to a mechanic or service station. You don’t want to be stuck out there in the great wilderness without help or a clue. Have the manual for your RV at all times. So often we toss out the manual or don’t keep track of where we put it—after all, we won’t need it, right? Wrong. A ratchet set is paramount, and so are Philips head and flathead screwdrivers of varying sizes. A hammer (with an adze or a mallet), a few wedges and a bunch of work gloves will come in handy. Safety goggles and other injury prevention equipment, like a helmet or kneepads incase the undercarriage of your ride must be accessed. Tire chains are vital when you approach unexpected inclement weather. Same goes for ice scrapers for window frost. Never pour water to melt the ice on your windows. And last but not least, a dependable compact ladder. RVs aren’t short vehicles, even with hydraulic lowering systems that bring the door to street-level. That engine is high. You’ll probably need a ladder to do anything effective in the heart and mind of your RV. But fear not—dragging an old 50-pound ladder with you from sea to shining sea is no longer a reality. With the advent of lightweight ladder technology, collapsible ladders can fold into conveniently small sizes and weigh next to nothing—perfect for the smart and organized traveler. The best part is, they can fold up like this while maintaining their durability and quality. While you’re up there tinkering in the engine, pour some more windshield wiper fluid in the reservoir. Now spend time scraping several hundred bugs from your windshield. Nope, you couldn’t do that without a ladder. Nor could you change the headlights or scare your sleeping family by banging on the window next to their bunks in the back. After all, you’re on a road trip; you might as well have some fun. Just don’t let that fun interfere with keeping yourself, your passengers, your fellow drivers, and your roving machine safe. It’s worth the precautions you take and the time you spend going through this checklist of essential items. And remember—you’re piloting a several-ton hunk of metal, often at speeds or declinations that would rival a rollercoaster. Take it easy, and take care of your RV and its cargo. This entry was posted in Blog, Tips and tagged rv safety, safety equipment. Bookmark the permalink.